Enjoy the best quotes from Arrow’s episode ‘Pilot’. Sorted chronologically as quotes appear in the episode. Oliver Queen (narration): The name of the island they found me on is Lian Yu. It’s mandarin for “purgatory.” I’ve been stranded here for 5 years. I’ve dreamt of my rescue every cold black night since then. For 5 years, I have had only one thought, one goal… survive… Survive and one day return home. The island held many dangers. To live, I had to make myself more than what I was, to forge myself into a weapon. I am returning not the boy who was shipwrecked but the man who will bring justice to those who have poisoned my city. My name is Oliver Queen. Moira Queen: Has he said anything about what happened? Doctor: No. He’s barely said anything. Moira, I’d like you to prepare yourself. The Oliver you lost might not be the one they found. Oliver Queen: No one’s called me that in a while, Speedy. Thea Queen: Worst nickname ever. Oliver Queen: What, always chasing after me as a kid? I thought it fit pretty well. Maybe it still does. Tommy Merlyn (to Oliver): Have you noticed how hot your sister’s gotten? (Oliver gives him a look) Because I have not. Laurel Lance: Why are you here, Ollie? Oliver Queen: To apologize. It was my fault. I wanted to ask you not to blame her. Laurel Lance: For what? Falling under your spell. How could I possibly blame her for doing the same things that I did? Laurel Lance: She was my sister. I couldn’t be angry because she was dead. I couldn’t grieve because I was so angry. That’s what happens when your sister dies while screwing your boyfriend. We buried an empty coffin… Because her body was at the bottom of the ocean where you left her. It should have been you. Oliver Queen: I know that it’s too late to say this, but I’m sorry. Laurel Lance: Yeah, I’m sorry, too. I’d hoped that you’d rot in hell a whole lot longer than 5 years. Oliver Queen: You killed that man. One of the kidnappers: You don’t have to do this. Tommy Merlyn: As your wingman, I highly recommend Carmen Golden. 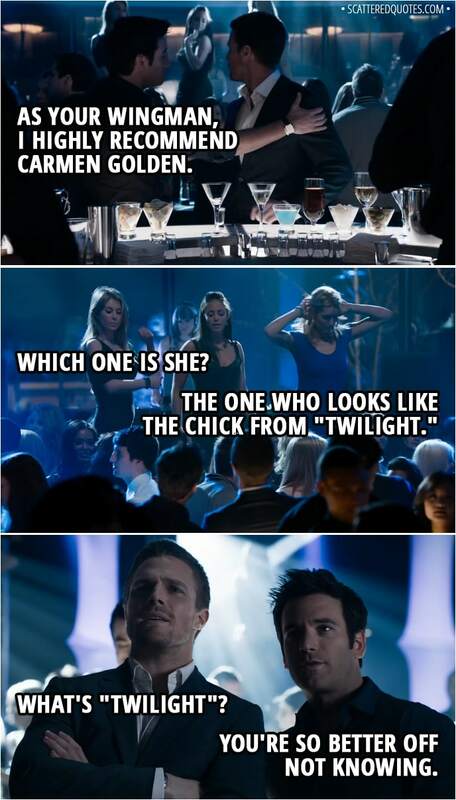 Oliver Queen: Which one is she? 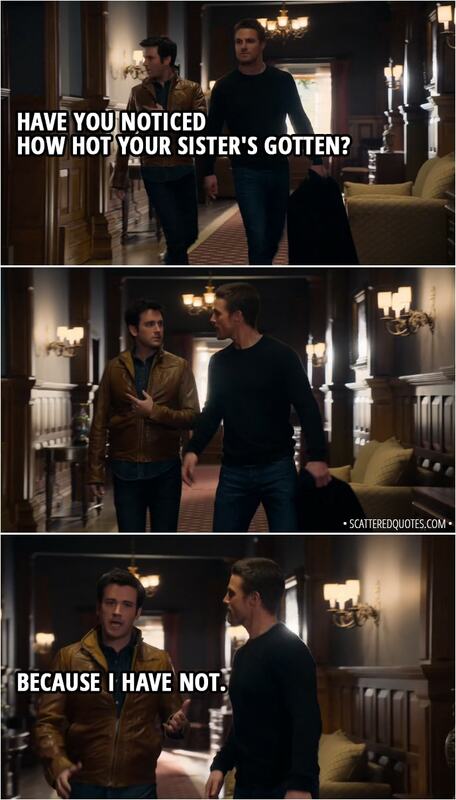 Tommy Merlyn: You’re so better off not knowing. Thea Queen: Ollie, I love you, but you can’t come back here and judge me, especially for being just like you. Thea Queen: Away? No. You died. My brother and my father died. I went to your funerals. Thea Queen: No, you don’t. Mom had Walter, and I had no one. You guys all act like it’s cool, let’s forget about the last 5 years. Well, I can’t. For me, it’s kind of permanently in there, so I’m sorry if I turned out some major disappointment, but this… me… is the best I could do with what I had to work with. Oliver Queen: Laurel… You always saw the best in me. Right now, that’s what you’re doing, looking at me, and you’re wondering if that island changed me somehow, if it made me a better person. It didn’t. Stay away from me. Otherwise… I’m just gonna hurt you again, but this time, it will be worse. Got to roll. I got 5 years of debauchery to catch up on! Laurel Lance: You know what, Oliver? You’re wrong. That island did change you. At least now you’re honest. Oliver Queen (narration): She says the island changed me. She has no idea how much. There are many more names on the list, those who rule my city through intimidation and fear. Every last one of them will wish I had died on that island. • What did you think about the pilot episode? • What is your favorite quote?